In terms of juice yield and juice quality, nothing comes close to Green Star twin gear juicers. I believe Green Star Pro Commercial Twin Gear Juicer is in the same league or maybe even better. The motor stays similar but a lot of improvements were made to make assembly much easier and to improve its juice extraction efficiency. It’s not just your standard household juicer, it can also be used in commercial application. This is the only triturating juice extractor that can be used in a juice bar without worrying about voiding the warranty. In the previous models the gears have a plastic end, now it’s 100% all stainless steel. In addition, it has more cutting points and recesses have been incorporated to aid in processing harder produce. This reduces the overall strain on the motor, making it more efficient. Let’s also not forget that the bio-ceramic and magnetic technology is still at the heart of the gears. All these small details help in keeping your juice nutritious and full bodied. To prevent heat build-up, the motor has now a built-in cooling fan. This will allow you to juice continuously in 30 minutes. You now have a place to put your favorite tamper on when not in use. No need to place it on the table or countertop, it’s really an added convenience. By the way, I like the wood tamper more than the plastic one. Green Star Pro has a commercial electric certification and was built with sanitation specifications in mind. If you plan to use it on your juice bar you’ll surely squeeze all the juices from fruits and vegetables up to the last drop. It produces the driest pulp among all the juicers I’ve reviewed. Higher yield from your produce means more revenue for your business. However, please keep in mind that there’s a trade off for that efficiency. Juicing from this machine is slow. You also need to remember that you can only use it continuously for 30 minutes. You’ll have to give it some time to cool off, then it will be ready again for another batch of juice. If you’re looking for a more reliable commercial juicer, check out this guide. And here’s what remains the same. Aside from juicing you can use this machine for your homogenizing or food processing needs. You can also make baby foods, bread sticks, nut butter, and frozen fruit sorbets out of this machine. There an optional pasta maker but you still have to prepare your dough. Twin gear juicers are quite intimidating and honestly, they are difficult to use at first. There are just too many parts to deal with. However, once you get used to it, assembly and disassembly can be done in under a minute. The quick release latch mechanism makes it even easier. In the previous models, there are a bunch of knobs that you’ll have to tighten to secure the parts in place. Though this juice extractor has a lot of parts, they are small and manageable, not to mention that these parts are dishwasher safe. Just give it a quick rinse and put it on your dishwasher. In addition, you’ll get complimentary cleaning tools, a cleaning brush with a lot of tips and a scraper set. The cleaning brush can be used to reach the difficult corners of the complex parts, while the scraper set can be used to remove pulp that was stuck in your juicing screen. I don’t mean to exaggerate but you’ll get the best tasting and the most nutritious juice out of Green Star Pro. It has all the technology that you won’t find in other juicers. It has a built-in cooling fan to keep the motor cool, all plastic parts are BPA free, and the best part of it can be found in its gears. What Kinds of Produce Can it Juice? This juice press can handle all types of produce–soft and hard produce, leafy greens, citrus fruits, beans, and nuts. Hard produce includes yakon, cauliflower, pumpkin, fennel, pepper, broccoli, cilantro, garlic, sweet potato, watermelon, pear, bitter gourd, coconut, asparagus, carrots, ginger, celery, apple, turmeric, pineapple, beets, and cucumber. Leafy greens include cabbage, wheatgrass, parsley, beet greens, moringa, collard greens, basil, spring onion, kale, brussels sprout, peppermint, pine tree needles, dandelion greens, lettuce, and spinach. Citrus fruits include mandarin, lemon, orange, grapefruit, lime and tangerine. Soft produce such as papaya, tomato, melon, avocado, peach, cranberries, mango, kiwifruit, blackberry, grapes, strawberry, and pomegranate can be turned into a puree using the homogenizing blank. You can also make soy and almond milk using this juice extractor provided that you soak your soy or almond overnight. There is no doubt that GreenStar Pro Commercial Twin Gear Juicer is the best juicer if we’re not going to consider the price. It’s the most efficient and the most effective juicing machine I’ve ever reviewed. A powerful household juicer that can also take commercial usage. 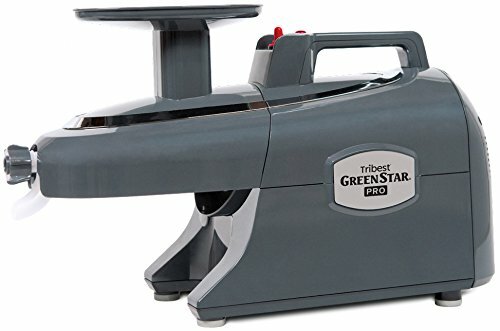 If you’re looking for your last juicer, Green Star Pro is perfect for you. It can be your everyday juicing machine for 15 years without the need for replacement. And if you plan to set up a juice bar, Green Star Pro GS-P502 can be your commercial juicer of choice. You’ll need to purchase more than one machine though and alternate usage to prevent overheating.